I studied Biotechnology Engineering at a first class Chemical Engineering University. Back then, and even now, it wasn’t always understood how biotechnology and the use of enzymes has more benefits compared to chemicals and how bio-processes are important to the fight against pollution. I’ve attended a couple of conferences in the past month, both focusing on bio-processes. The Industrial Synthetic Biology Congress was held in Munich at the start of October. Two weeks later I travelled to Toulouse for EFIB (The European Forum for Industrial Biotechnology and the Bio-economy). The talks, presentations and posters at The Industrial Synthetic Biology Congress displayed bio developments in the flavour, fragrance and bulk chemical industries and highlighted bulk food ingredients manufacturing. The metabolic engineering approach to use whole cells to manufacture the final ingredient has developed significantly over the past years. It includes several cascade enzymatic reactions to produce the final molecule of interest. The range of organisms is increasing as expertise is developed in this area. The topic of using cell-free synthetic biology was also discussed with the key message being, ‘The application matters’. Even if the engineers change the metabolic pathway to use whole cells, the manufacture of the product of interest or cell-free synthetic biology approach will be used. The important part is what the application is and what are the commercial goals behind it. In both cases the bio-process is mild and has less waste. 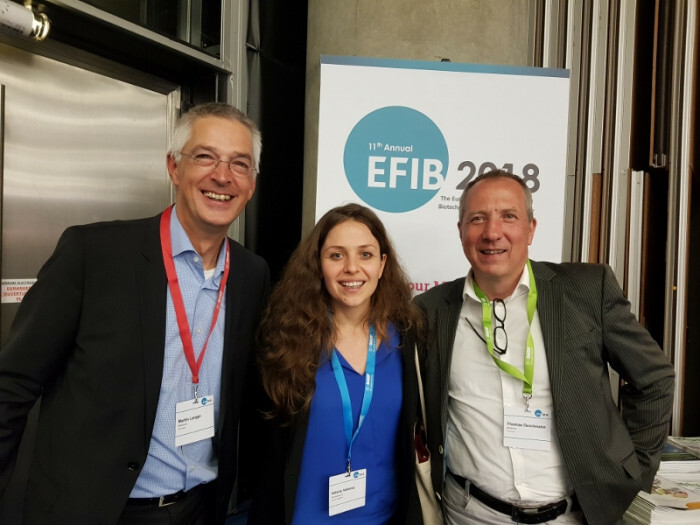 EFIB was a much bigger event and while The Industrial Synthetic Biology Congress was focusing more on developments, EFIB focused on the actual implementation of the bioprocesses. Topics discussed at EFIB included renewable and degradable plastics along with the development of bio-materials, food and feed ingredients, bio-based cosmetics, marine biotech and how to utilise seaweed, microalgae and marine bio-resources. Large companies are looking to use enzymes to fight the war against plastic pollution. There is also a move towards sustainable innovation and bio conversion to limit the use of harsh chemicals being used. It was really satisfying to see how the bio economy is now focusing on pollution and how much investment is dedicated to this topic. Independently, BBC has produced several documentaries on this topic and after watching them and attending the events, I appreciate even more that Biocatalysts (and BRAING Group) are part of this revolution supporting the implementation of bio-processes for a better and cleaner planet.